Mussels are popular shellfish that are easy to prepare and serve. 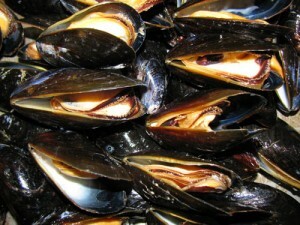 Mussels are used in many traditional dishes such as paella, moules marinieres, neopolitan mussels, Cioppino, and others. Where Do Mussels Come From? Mussels are found along cool ocean coastlines around the world, often in vast colonies. Mussels attach themselves to rocks, pilings, and other hard surfaces with tough, thread-like filaments known as byssuses. The blue or common mussel is found along the coastlines of North America, Europe, and other areas. In many locations, wild blue mussels can be harvested by hand and taken home for dinner. Farm raised blue mussels are available in many areas, either live in the shell, frozen in the shell, or meat only products. Blue mussels can be steamed and eaten by themselves or used in a variety of dishes. Blue mussels can also be served raw in the same way as oysters. The Mediterranean mussel is similar to the blue mussel but slightly smaller and wider. In North America and Europe, this species often replaces the blue mussel along its southern range. The bay or foolish mussel is nearly identical to the blue mussel and can be used as such in recipes. Bay mussels are found from California to Alaska. The California mussel is found along rocky shorelines from northern Mexico to the Aleutian Islands of Alaska. This large edible mussel can grow to over six inches. The green-lipped mussel is a shellfish from the coast of New Zealand. Green lipped mussels are said to contain a number of vitamins, minerals, and trace elements. Green lipped mussels are also high in protein. Farm raised green-lipped mussels are widely available in several forms. Mussels should be cleaned and rinsed before cooking. Discard any mussels are open or broken or that do not move or close when tapped. Wild caught mussels can be scrubbed with a brush to remove any barnacles, sand or grit and their beard must also be removed. This can be done by pulling the filaments off, trimming with shears or by cutting with a sharp knife. Wild mussels can be rinsed but not allowed to sit in water, as freshwater will kill them. Farmed mussels usually just need a quick rinse under cold running water.